Option to add a hard ceramic shelf kit. Includes a ceramic shelf (7" x 7") and 3 x square kiln posts. The Paragon SC-2 in lovely Purple with a Glass Window. Also includes a soft ceramic fibre shelf kit. This kiln has been in production since 1997; its proven design is used and trusted by thousands of artists around the world! The high-tech ceramic fibre firing chamber is wrapped in a steel inner case. The outer steel case remains cool due to the layer of air between it and the inner case. In addition, the case is slotted for air circulation. Electrical components, located in the base, stay cool even at extended hold times. The SC-2 can hold three shelves of silver clay yet is portable enough to take with you to classes. Program the firing schedule that is perfect for you - there are no permanent pre-set programs. The programmer turns itself off after the firing is completed. The SC-2 is great in classrooms because the elements are embedded in ceramic fibre. This newest SC-2 has two separate heating elements in the left and right sides of the firing chamber. 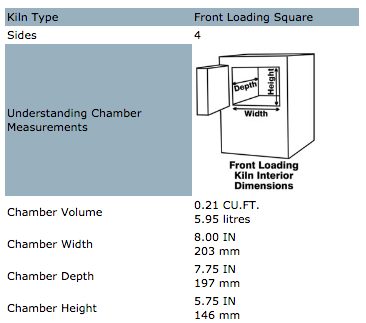 The back of the chamber has no element. Extensive testing shows that the heat distribution in the current SC-2 is more even throughout the firing chamber, because heat does not build up in the back of the kiln. The SC-2 is proudly made in the U.S.A. to exacting standards. It fires automatically at the rate and temperature you enter. A large, brightly lit display prompts for firing rate, temperature, and hold time. Use the hold feature to automatically soak any type of clay silver to its recommended time. The fast-firing element is embedded in the firing chamber shell. Each SC-2 includes a .6cm (1/4") thick ceramic fibre shelf and 3 x 1.6cm round posts. This solid ceramic shelf can withstand temperatures up to 1222°C. Create multi-layered kiln shelves for firing numerous items inside the kiln by stacking kiln posts and shelves. Perfect size for the Paragon SC2, Paragon SC2 Pro and the Lilly Kiln. 3 x 1" kiln posts also included. We recommend you use three kiln posts instead of four to support shelves. Four posts can cause the shelves to wobble unless the bottom of the kiln is completely even, the kiln shelf is completely flat, and the posts are exactly the same height - three things which you'll rarely find all together! Position the kiln posts close to the kiln walls and away from the centre of the kiln. Please note: Ceramic kiln posts are fragile, and they don't always look perfect. We make every effort to pack them well, but accidents (and brutal delivery services) can happen and one might break in shipping. If this happens, just email us a photo and we will credit you the cost of the post. We won't ship a replacement as this isn't viable with postage and packing costs. Small chips which are cosmetic only and doesn't affect the functionality will not be credited. The 2.5cm x 7.6cm window is beveled for a wide view of the kiln interior. The high-tech ceramic fibre firing chamber is wrapped in a steel inner case. The outer steel case remains cool due to the layer of air between it and the inner case. In addition, the case is slotted for air circulation. Electrical components, located in the base, stay cool even at extended hold times. The view port is especially useful for glass fusing and copper enamelling. Watch the glass or enamelling progress through every stage of firing to the precise stage you desire. The embedded element heats from the two sides for improved heat distribution. Colorful, illustrated instruction manual (separate from the kiln manual). Download it from the “Additional Information” section below to review these features in more detail.